Posted March 30, 2015 By shawn and has Enter your password to view comments. Posted March 29, 2015 By shawn and has Enter your password to view comments. Posted March 18, 2015 By shawn and has no comments yet. Rough notes from my opening remarks as Toastmaster at my club. Do you like sweets? Confections? Do you remember the jelly bean craze? (Ronald Reagen). Bite into one and never know what you are getting. Or buy fudge: outdoor market. Never know. You do not quite know what you get from these confections. You bought the box on a friend’s recommendation. Hope it good, the box that is, and the friend. Not know what to expect. Can read the box, the ingredient list. Know they be good. Not know what to expect. Bite in, taste that sweetness (marzipan, hint of cinnamon, dark chocolate and pecan, hint of coffee bean, Irish cream. Before you had it, read about it, not know what to expect. Bite into a confection, and it is so worth it. Confections! Like confections: other things in life. Read about. Talk to friends/associates. Sounds good. Not know what to expect until you experience it. Like confections, conventions and conferences are same way: read about them (brochure, website), talk to past attendees. Not know what to expect. But, like biting into a fine Frenc\ pastry with whipped cream and a touch of lemon, they are worth it. You have the opportunity to experience a convention, and like eating a double glazed doughnut, you will not be disappointed: D21 Spring Conference, May 8-10, in Victoria. Me: attended two TM Spring: Nanaimo and Kelowna. Well worth going. Meet new people, take part in useful education sessions, listen to dynamic keynote speakers, follow a high stakes speech contest, and enjoy the food and company. If you joined TM to be able to speak to strangers: what a great opportunity: you are all in this together. If you haven’t already, I encourage you to sign up. When I attend conventions and conferences, I am a sponge: What can I soak up? How much can I learn? What can I leave with and carry with me afterwards, into my speeches, my business, and my life. If you go with such an attitude, that you are a sponge, you will find all conventions and conferences to be worth it, just like fine French pastries or a box of Swiss chocolates. Today’s theme: conventions and conferences, and I encourage you to be a sponge, and attend our upcoming convention. Helping me to encourage you, and excite you about conferences, is our team of dedicated TMs. Posted April 5, 2014 By shawn and has no comments yet. 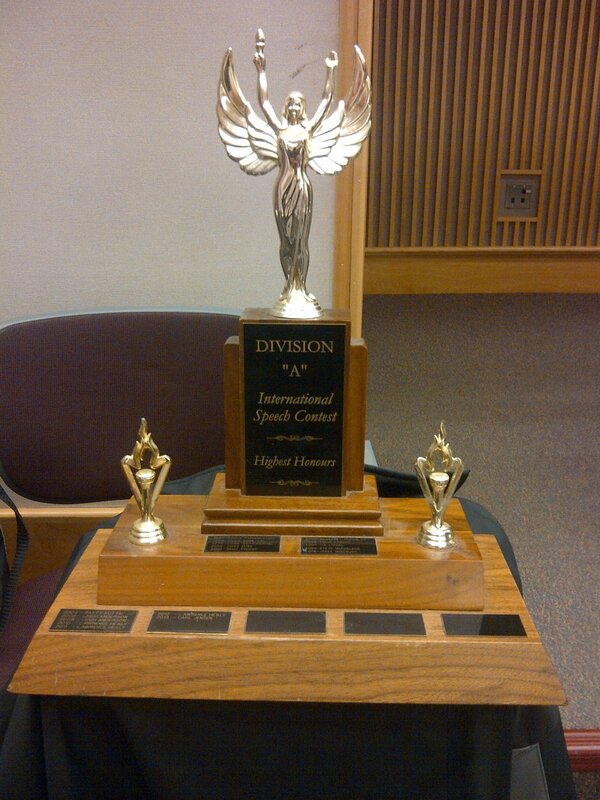 I competed against five other contestants from this division, and won! 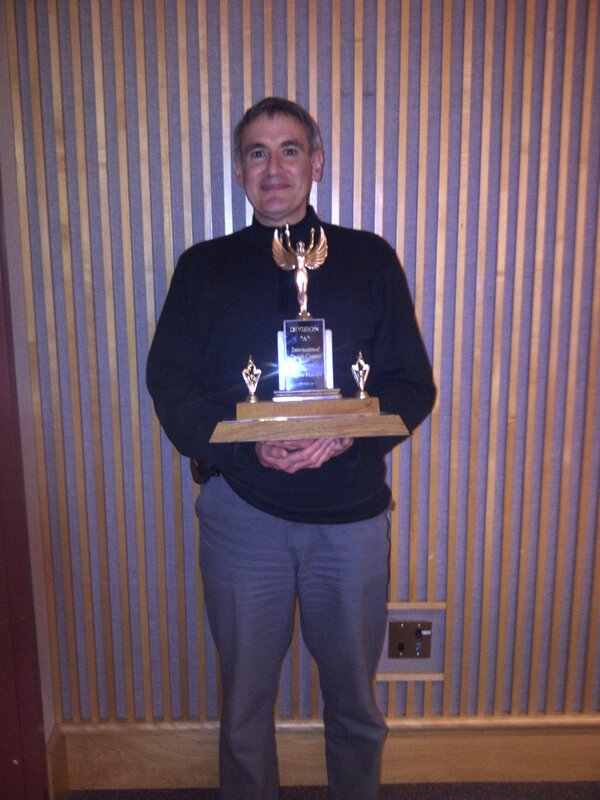 I get to keep the big trophy for a year – still to be engraved. The crystal award I keep. I am very pleased to have won. Now I will plan my trip to Kelowna for the next level: District championship. Posted March 27, 2014 By shawn and has no comments yet. Posted March 21, 2014 By shawn and has Enter your password to view comments. Posted March 20, 2014 By shawn and has no comments yet. Providing testimonials for fellow chapter members and colleagues is an extension of generating referrals. I will use the terms Reviews and Testimonials interchangeably. For search engines, Reviews is a better term to use on a website. People search for reviews, not testimonials. This is from a BNI article: The Art of an Excellent Testimonial. Testimonials must be given from a position of knowledge; you need to have used the goods or services before you can give a testimonial. Specificity is the key, how and why you used the product and how it performed. Include some basic details about your age and demographics. Honesty is the best policy. If there were glitches in performance but you were overall satisfied, include that information so that others can make an informed decision. Be sure to acknowledge your own role in any shortcomings. If you can’t say anything nice, don’t say anything at all—at least in public. If you truly had a poor experience, take it directly to the company or person to correct the situation. Short is sweet. You can give a great testimonial without giving two paragraphs of back story about why you decided to use the service. Put it in writing. The very best gift you can give a company or person is your testimonial in writing. Whether you write an online review or speak up in a meeting, putting it on paper gives them something tangible that they can use to market themselves even better. In our chapter, we give a copy to the member, on paper, and we put a copy in the book. But that is ineffective. This is the first half of the 2nd decade of 21st century. We have to get with the times! Business owners can display it in their shops or on their websites, but there is lots of cynicism about reviews on websites. If we want to truly help our fellow members: Put it online. Reviews are strong links that show trust. Reviews are important to rank well in Google as well as propelling the Google Places listing. Get as many reviews as you possibly can on as many different sites as you can, this will help a lot in improving your ranking. Review sites include Yelp, Urban Spoon, Trip Advisor. Google Places through Google+. There is a review site for just about every industry. Google goes through review sites. It helps drive traffic to websites. Post your review to social media. Facebook & Twitter. The reviews go out to your followers/friends. It is much more powerful if a friend sees that you used a particular service. You should ask your clients for reviews, all the time, so there is steady stream, looks genuine. People are going to review you anyway. Since our natural tendency is to complain rather than praise, encourage people to review, so the good ones outweigh the bad. If you get a bad review, it can tell you where to improve. You can respond to turn the issue around. It makes it all look genuine. With 30 members, if we put testimonials online for even half our number, each, we’d all have 15 positive online reviews. My goal: review all BNI testimonials and put them online. Posted March 19, 2014 By shawn and has no comments yet. I delivered the speech to two members and one guest of my Uptown Rollers chapter. Small group. I threw in a comment and threw myself off. My timing was 7:10. I won’t do that again. This was for speech #6. Two more to go to get my CC. 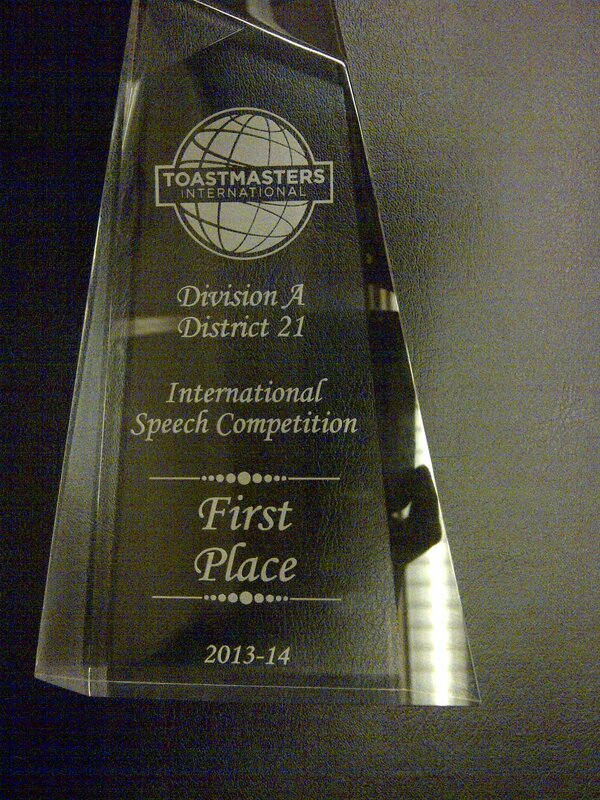 I delivered the speech to Toastmasters International Speech Contest for Area 7, the one my chapter is part of, and won! I did stumble over the word ‘Skip’, and I did go through it quicker, which I tend to do in a contest, being very aware of my time. Next is the Division contest in a few weeks, the same day as we get a puppy. Must keep practicing. Posted March 14, 2014 By shawn and has no comments yet. My Toastmaster’s club had an open house, and I realize I should not do a speech warning potential members away from Toastmasters. The speech talks about how I became affected by Ums, and gives a dire warning to TM’ers. I will change the focus, write some members of my club for input. That will be interesting. Posted March 6, 2014 By shawn and has no comments yet. I’ve been reading articles and listening to BNI podcasts about how to grow our chapter, how to get more members. Why should we grow? With more members, the energy level increases. The bigger the group, the more positive energy we would have, and a higher energy level attracts more people. Most importantly, we want to grow for the main the reason we are all here: more business, more money. BNI head office tracks all this and they find that a group’s referrals and overall revenue grows as the membership increases. As the number of connections grow, the number of referrals grows, both internal and external. So as we grow, more visitors get to hear our infomercials and see our presentations. And do business with us. We are around the 30-member mark today. There is more growth after 30 members, and exponential growth after 50. Some chapters have 80 members. How do we get there? We have to invite more people, more quality guests, as potential members, but we have to be careful with Category Cowboys. Here is a link to a slideshow done by a BNI member in the UK, Dan Fletcher: Cartoon Box: Classification Cowboy. We have to be aware of Category Cowboys. The classification you joined under is your classification. But you know your profession, and what your core business is. Ask yourself ho can you invite or have join us that complements you? That you refer business to? Be wary of pre-judging guests. In my case, we are in the Web design and hosting category. Some of you think we do social media, that it is grouped together. We are not a social media company. We do set up social media accounts, and we do help our clients with their social media strategy, but it is not our core. If a social media strategist wanted to join, I should not be a category cowboy and block the application, even if that strategist claims to do websites. If the person did join, I should stick to infomercials about websites, and the social media strategist should stick to infomercials about social media. We had a former member who only dealt with clients that had over a certain dollar amount in assets. In hindsight, we should have had a spot for someone who dealt with those who had less than that dollar amount. That person could have been from his firm, or from another. Some BNI chapters have five lawyers, or two real estate agents, for residential and commercial. To sum up, you know your core/classification, so stick to it, and encourage guests and membership from those you can refer business to, even if other members think you are both in the same profession, so our chapter can grow and prosper. BNI Podcast: Episode 334: We’re at 55+. Now What?